We know there’s life in the Universe. We see it all around us here on Earth. But is there life anywhere else? By studying the extremes that life can take here on Earth, scientists are learning just how hardy and adaptable life can really be. And if you consider other ways that life might function, the options open up considerably. This week we’ll discuss the study of life – extreme life here on Earth, and the possibility of finding life on other worlds. Fraser Cain: I wanted to let people know, and you may have noticed now that we’ve got new album art and a whole new logo for AstronomyCast. This was designed by one of our listeners, Luke Fielding. Luke has also designed some CD cover art and we are going to be coming out with some CDs in the near future. We’ll give you more details when that actually happens. Thanks to Luke and if you haven’t seen it you can come to our website but you should be able to even see it right on your iPod or on iTunes. As you’ve noticed, publishing has been sporadic. Pamela’s travel schedule has been absolutely crazy. We have these days where we record four episodes in a day. Then she’s off on some other trip, other people edit them and so we’re doing the best we can. Dr. Pamela Gay: The International Year of Astronomy will end on December 31, 2009 and then all of you will have my highest priority again. We’re so sorry. Fraser: We know there’s life in the universe, we see it all around us here on Earth but is there life anywhere else? By studying the extreme that life can take here on Earth scientists are learning just how hardy and adaptable life can really be. When you consider other ways that life might function, the options open up considerably. This week we’ll discuss the study of life, extreme life here on Earth and the possibility of finding life on other worlds. Just how hardy is life? Fraser: Well okay let me ask you a more specific question. How hardy is the life we found here on Earth? Pamela: There are things that really don’t want to die. Fraser: [Laughter] Right other than me and you [laughter] I know what you mean. Things that live in places that would kill us in an instant right? Pamela: Not only that but there are critters that have adhered themselves to the outsides of spacecraft, gone up, come back down and they’re still going strong. There are these little tiny invertebrates called water bears – they look like gummy bears with vicious claws – but they’re really little tiny microscopic organisms. You’d only really consider one bear sized if you were a millimeter tall. You can’t kill them. They are happy with outer space. They are happier here on Earth. These fall into the category of things that will not die. Fraser: Yeah, radiation is fine, make it hot or cold, it’s all good. Pamela: Yeah they just turn themselves off when it gets too harsh and re-animate themselves when life is back to being more like what they want. Fraser: What has the search for extreme life on Earth – I know there’s been sort of a revolution of that in the last few years – what is sort of the history of that then? Pamela: The normal thing that we learn in elementary school is that life requires water, sunlight, oxygen and it requires moderate ph. It requires moderate temperatures. Life in general we learn is fragile. Anyone who takes their first fish and over-feeds it or dumps it in the water too fast knows fish die really easy. This reinforces the idea that life is fragile. What’s fragile is complex life. What’s fragile is intelligent life. Once you start getting down to the little critters the single-celled organisms then you start getting into finding things that can live anywhere. We have found organisms at the highest and lowest ph values. We have found them in the coldest and hottest places on the surface of the Earth. We find them at high altitudes and very deep underground. It seems that the smallest organisms are fully capable of adapting themselves to live in just about any environment. Fraser: This obviously then is sort of leading to the search for life on other worlds? Pamela: We’ve developed this entire new field of biology called astrobiology or in older sci-fi it was called exobiology. They’re really the exact same thing. What we’re trying to do is define okay we know here on Earth we’re finding life in all these crazy venues. Once we start relieving the well life requires, what is actually required? Where in the universe can we find those actual requirements which still exist but are much looser in their criteria? Fraser: How is that criteria changed? Pamela: Nowadays instead of saying that life requires liquid water, instead life requires liquid solvents, things that can facilitate different chemical reactions. Things that can facilitate things dissolving for instance with the restrictions strictly looking for liquid solvents. That means that we can look for life that perhaps lives off of sulphuric acid. It opens up Venus as a place where life might be possible in a way that doesn’t exist here on Earth at all. Pamela: A solvent is any chemical that will break molecules apart. When you pull out the nail polish remover that is a solvent that tears apart nail polish. Water can be a solvent as well. Consider all sorts of different random dirt, random molecules that just fall apart – sugar dissolves in water. Anything that causes molecules to dissolve, causes compounds to dissolve, that’s a solvent. Fraser: How is that important for life? How is life using the solvent? Pamela: Our body is nothing more than a large bucket of different chemical reactions. We need that water to facilitate all the different chemical reactions from just eating our food through to dissolving the fat in our body to sloshing the blood in our veins around in our body. All of these things require a liquid. Within our blood it’s not so much as a solvent as it is we need plasma to keep things moving. Liquid in general is facilitating all of these chemical reactions taking place that keeps the body moving. It keeps the body energized and allows the body to take base compounds and transition them into being energy that the body can use to then do locomotion and other activities. Fraser: I see it’s almost like if you have some chemical process in your body and you need to change the chemical. Or you use energy or get access to one of the atoms on the chain you need solvents so you can kind of take it apart. You can let the atoms and molecules float around so that you can recombine them in different places. If you don’t have a solvent then it’s all just kind of locked together and there’s no easy way to move things around. Pamela: That’s exactly what’s happening. Fraser: What else then? We’ve got solvent so what else have scientists changed their attitudes about? Pamela: Instead of strictly saying that we need sunlight and food we’ve changed that into simply: you need an energy source. In general some sort of a thermal gradient helps. Pamela: This is where you have hot and you have cold. That’s not as required. That just helps get the chemical reactions going. In general all we really need is an energy source of some sort. Fraser: That could be sunlight. Pamela: Volcanoes under the ocean. Pamela: Compression. At this stage basically we need an energy source and a liquid solvent. Then you need the raw stuff. Even what that raw stuff is has changed. Instead of saying strictly we need organic molecules based on carbon, nitrogen, oxygen, now we’re saying maybe it’s possible to have life that’s built on ammonia. Maybe it’s possible to have life that’s built on silicon or plays. We’re changing our ideas of what sorts of base materials are needed to build up these life forms. Fraser: Yeah because at the end of the day you need to be able to have some way to extract the energy from the environment. You need some way to move your molecules around into some other and then use it for something. That’s it. If you’ve got an energy source then you can power it all up. If you’ve got a solvent you can move those molecules and atoms around and recombine them in different ways. Pamela: What’s interesting is we’ve been trying to experimentally figure out what are the limits on where life can exist? Also under what circumstances can the types of molecules that we find in life form? The experiments that we’re all most familiar with are the Miller-Urey experiments that took place back in the ‘50s. They used electricity and a bunch of organic molecules and water and they stirred things up and mixed it around. They looked to see what organics they could create that were more complex to see if they could perhaps synthesize amino acids. What’s cool though is those aren’t the only experiments that have led to creating these complex molecules. Stanley Miller one of the two who was involved in this experiment also took and created a frozen experiment. He mixed a vial of ammonia and cyanide and kept it at minus 108 degrees for 25 years. That’s minus 108 Fahrenheit. For 25 years he kept this vial extremely cold. You’d think at that low of a temperature there would be no chemical reactions going on. This is a temperature like you find out on Europa – one of Jupiter’s icy moons that we think has liquid water. What he found was after 25 years the ammonia and cyanide had very, very slowly undergone chemical reactions and had started to form complex organic molecules. Even in extremely cold environments you can still get chemical reactions taking place, just at a slower rate. Fraser: As long as you’re not at absolute zero there can be a temperature gradient that can help the process move forward. You just have to redefine your idea of time. How does this then apply to search for life at least here in the solar system? How have scientists applied this so far? Pamela: There is a scientist called Peter Ward. He’s an astrobiologist. He’s been working to try and find first of all what vocabulary can we use to start storing any new life forms that we have? Here on the planet Earth we have the whole tree of life that we all memorized in about 10th grade. It assumes everything is based on DNA here on the planet Earth. He’s been trying to think outside the box and figure out as we move around the solar system instead of looking for our normal carbon-nitrogen-oxygen life, what other things can we look for? What he’s identified is in the inner solar system instead of looking for water-based life let’s look for life that might be based on sulphuric acid. As we move further out in the solar system why don’t we look for things that are based on methane? We know here on the planet Earth in fact we used to have methane-based life as one of our primary life forms. As you move even further out can we maybe envision life that lives off of liquid nitrogen or even colder yet, liquid hydrogen? He’s working to figure out what are the chemical environments in which you can start to get chemical reactions. You have the solvents and what are the specific places and temperatures where each of these different solvents, are they going to play the role of water here on the planet Earth. He’s also looked to say what are the different types of elements on which you can build life? We look primarily at carbon and silicon as the atoms that form the rich molecules that may be capable of supporting life. He’s working to define like I said the solvents and also trying to figure out what are the different energy sources that we can consider. What are the different habitats? Everything from maybe we can get life living in the Venusian’s clouds or we can get it living in the ices of Triton out orbiting around Neptune. Trying to define the places to look and the chemical reactions to look for is a good starting place. Without knowing what chemical reactions to look for we can’t actually test for life. We have to start by figuring out what is possible and then go out and look for it. Fraser: I guess that was my next question. How would you actually try to find it? What would you need to equip a spacecraft or a rover to be able to find this kind of life, or any life? Pamela: [Laughter] That’s one of the really great questions. The Viking probes when they landed on Mars attempted to look for life. We had thought that certain organic molecules only occurred in the presence of life. We thought that when you made certain mixtures they would give off oxygen if life was present. Then people thought about it and realized that there are all sorts of other things that can cause the same outcomes. Fraser: What happened with the Viking mission? I know that the Viking landers were equipped with a little scoop and they could dig up a little bit of dirt. Then they put in food, like some kind of mixture into the dirt and detected to see if there are any chemical processes that would be indicated for life. The results were inconclusive, right? Pamela: The results were inconclusive because they failed to consider all the different compounds that could exist in the soils on Mars. The problem they ran into is they got a positive result but they couldn’t figure out if it was a positive result because of the stuff that exists within the Martian soils or because there was life. When they started looking for organics they couldn’t find organics at that point. It was one of these things where they got the chemicals released that you’d expect to be released if there was life. But then when they searched for the organic molecules that would make up the life they couldn’t find them. That’s where the inconclusive results came back. Fraser: Some of the following stuff, nothing else has been as equipped to search for life almost as the Viking landers. I know that Spirit and Opportunity have no way to search for life. I don’t even think the Mars polar lander can do it. Pamela: No and this is where things have gotten controversial. There are a lot of scientists that are like we just want to go look for life! And really you can’t blame them. That would be so cool. At the same time that’s expensive and controversial. What we’re doing instead is we’re slowly building up the laboratory picture of okay, assuming that we’re looking for life that’s like anything that exists on Earth, let’s go out and let’s look for organic molecules. Let’s go out and look for water. Let’s go out and look for all of the building blocks that you would expect to find here on Earth if you were probing either Antarctica or the Atacoma desert or some other really harsh environment to see if it was capable of supporting life. One of the really intriguing results was yes. Mars is capable today of supporting life. Now we just need to define what experiments can you run to took for that life? Here we’re talking about single-celled organisms nothing complicated. Fraser: Right. We’re definitely not talking about Martian civilizations with canals. Pamela: No, we’re talking about like single-celled amoeba happily existing in the sands of Mars. Fraser: Okay so what are some of the future experiments that are going to be heading towards Mars? Pamela: The next best chance we have for looking for not necessarily critters but the type of stuff that you get when you have critters is the Mars Science Laboratory which is also known as Curiosity. It’s an upcoming rover. It is huge by rover standards. It’s probably going to insert itself into orbit sometime around 2012. It is hoped that it will last about 690 Earth days, so it’s going to last a couple of years basically. It’s heavy, about 2,000 pounds and it’s going to carry a whole bunch of different instruments on it. One of those instruments is a chem-cam. It’s a suite of remote-sensing instruments that will include things like a laser-induced breakdown spectroscopy system. That’s a big mouth full for saying they’re going to heat things up with lasers and see what they can excite that will allow them to tell what elements are involved. Fraser: This is going to be a robot with lasers on Mars zapping rocks. Pamela: Yeah, vaporizing rocks. They’ve stepped beyond zapping. This means that they are going to finally be able to do detailed analysis of what sorts of minerals are there down on the surface. They’re also going to have a chemistry and mineralogy x-ray and x-ray fluorescent instrument. They will be able to look in amazing detail at minerals in all sorts of different ways. Beyond that they’re also going to have a gas chromatograph that’s going to start to allow them to vaporize things and get out what are the ratios of the different elements within the samples. All of these things are tuned to allow them to look at isotopic ratios. We know life prefers specific isotopes. It’s going to allow us to look for different organic molecules. We’re going to get a better and better idea of what are all the chemicals all of the molecules that you can find at the surface of Mars. We know if you vaporize basically an anthill you’re going to have certain organics given off. We’re not going to be vaporizing anthills on Mars. If there are signs of life we’ll be able to see the increase of ratio one isotope of carbon over another isotope. We’ll be able to see here there is a whole bunch of organics; over here there’s not. We’ll be able to see the differences from place to place in the chemical compositions of the soils. Fraser: Right and so we’re going to have to wait just a couple more years until that mission gets to the surface of Mars. I know it’s not going to work the same way as the rovers because they have big solar panels while this one is going to actually have a nuclear reactor onboard. Pamela: One of NASA’s very last. Fraser: Sort of the same thing as on Voyager and Cassini. Pamela: Right and this is going to allow it to have much more powerful – it’s going to allow it to have lasers – and blast things apart. That’s just cool. Fraser: Yeah, work in the winter and work in the summer and just keep working. We talked a bit about molecules in space. 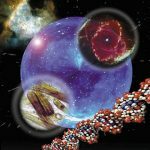 Do you think that some of the new research that’s been done in terms of astrobiology and thinking about extreme life? Some of that could help astronomers could pitch in actually detect some of that stuff with their telescopes. Pamela: This is actually one of the most promising ways of looking for life. I think just like digging through the Atacoma desert wouldn’t lead you to easily find life here on Earth even though there is life in the Atacoma desert. The easiest way to find life on Earth is to look at our atmosphere. Look for the oxygen signature of the plant life. Look for the pollutants that are created by humans. By looking for molecules in atmospheres that don’t occur there unless there is life putting those molecules and compounds in the atmosphere we’re able to get a much better sense of what exists on the surface of the planet. One scoop of soil may not have any life in it. One scoop or I guess one breath’s worth of oxygen from the planet Earth proves to us that there’s life on the planet Earth. We’re at the stage where we can start looking for different molecules, different gases in the atmospheres of alien worlds. We’re working to build higher resolution spectrographs. We’re working to build spectrographs that are capable of better distinguishing the light of a parent star from the light of its planets to better block out the light of that parent star so we can see the planets in isolation. All of these different things will allow us to get a better sense of what are these alien worlds and do any of them contain life in either a methanogen form or in something that deals with oxygen or in an intelligent polluting form. Fraser: We will soon have the technology. There will soon be the equipment to – soon being within the next decade – to image the atmospheres of planets going around other stars and to be able to analyze the constituents of Earth-sized worlds going around other stars. Pamela: We just need to find them. Fraser: Right we need to find the worlds, analyze their atmospheres and then we say if we see a world like Venus we’re like oh, runaway greenhouse effect. If we see a world like Mars we could say, oh lost its atmosphere, very thin carbon dioxide atmosphere. Maybe if we see a world like Earth and we see large amounts of oxygen, then that would have to come from some form of life keeping the oxygen in the atmosphere. I guess all this additional work to come up with these other chemical process could then either then look at an atmosphere and say oh, that’s one that’s using silicon and putting out different kinds of constituents. Pamela: It’s all basic chemistry. We know that things like methane fall apart in the sunlight. We know that things like oxygen like to bond with things like carbon. By knowing the basic this does not exist in free-form except for limited periods of time. By knowing the rules of how long things can last before they get bonded or destroyed we’re able to say we have this amount of certainty that we’ve now found life. We haven’t found it yet. Fraser: There’s something pretty close with Mars now, right with the discovery of methane in the atmosphere? Pamela: Yeah, but there the issue is methane can only exist for a small amount of time before the sunlight destroys it. Methane can come from two different sources. It can either come from a planet out gassing because it was hot chemical reactions took place deep in the soil, deep inside the planet. As the planet outgases it releases methane. You could end up with methanogens down in the soil that is also releasing methane. Methanogens are the same type of critters that exist in the guts of humans and cows and cause them to make rooms stinky occasionally. If it is methanogen, that’s kind of cool but it could have a geophysical cause so we can’t say anything with certainty as long as the world is active. Fraser: At the same time both answers – in the case of Mars anyway – are interesting. Scientists aren’t sure what the geological state of Mars is either. If you can trace it back and say you know it’s still volcanically active that’s kind of interesting. Pamela: Yeah, Mars is a very interesting curiosity and there are lots of people chomping at the bit to go dig in its soil and explore it firsthand. Pamela: Well we got used to Spirit and Opportunity. Fraser: I know so I guess we will get used to calling it Opportunity – I’m sorry calling it Curiosity. It doesn’t roll off the tongue for me yet. Pamela: No, it’s a laboratory. Fraser: Alright thanks a lot Pamela. This transcript is not an exact match to the audio file. It has been edited for clarity. Transcription and editing by Cindy Leonard. Speaking of the 25 year cold vial, is there an envelope of conditions which must exist for life to arise? I believe there are organic molecules in H II regions such as the Orion Nebula? On Mars, will we eventually need to drill core samples?